Theoretically, reducing the number of ports required in minimally invasive surgery for gastric cancer would further minimize trauma associated therewith. Advances in single-site surgery have afforded surgeons the ability to perform reduced-port distal gastrectomy via a robotic approach using the Single-Site™ system, eliminating restrictions on the movement of surgical instruments. This phase I/II study was designed as a single-arm prospective trial of reduced-port robotic distal gastrectomy (RRDG) by a single surgeon (NCT02347956). From January to October 2015, 40 individuals scheduled to undergo robotic surgery for early gastric cancer were asked to participate in the trial. Nineteen were enrolled and underwent RRDG. The primary endpoints were 30-day morbidity and mortality. No intraoperative event requiring conversion to laparoscopic or open surgery occurred, and no major complication was observed following RRDG (0.0% [80% CI (0.0–11.4%)]). Medians of operation time, blood loss, the number of retrieved lymph nodes, days until gas passing, and hospital stay were 190 min, 20 mL, 48, 3, and 5 days, respectively. 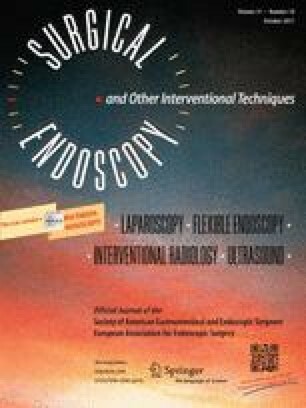 Deemed safe and feasible through the present trial, RRDG could be a valid alternative to conventional robot distal gastrectomy for managing early gastric cancer. Our reduced-port robotic surgery using the Single-Site system and a third robotic arm could potentially be applicable as a highly advanced, minimally invasive surgery for other solid organ diseases. This study was supported by Basic Science Research Program through the National Research Foundation of Korea (NRF) funded by the Ministry of Science, ICT & Future Planning (NRF-2013R1A1A1007706). The authors would like to thank Anthony Thomas Milliken, ELS (Editing Synthase, Seoul, Korea) for his help with the editing of this manuscript and thank Soyoung Kim, Kyoung Hee Lee, and other nursing staff members for their professional help and enthusiasm. Mrs. Youn Nam Kim, Mr. Dong-Su Jang, Drs. Seungho Lee, Jin Kyong Kim, Yoo Min Kim, Taeil Son, Woo Jin Hyung, and Hyoung-Il Kim have no conflicts of interest or financial ties to disclose.